Seven years ago, writer-director James Cameron was an unknown entity with only an ultra-low-budget horror picture to his credit, Arnold Schwarzenegger was a world-class bodybuilder with a few less-than-world-class movies under his belt and Linda Hamilton was a young actress with a number of nondescript teen roles on her brief resume. The Terminator changed all that. A landmark science fiction film whose nonstop techno-action was punctuated with rare humor and an affecting love story, The Terminator was the impetus for major career breaks across the board. In the next half-dozen years, Cameron would become one of the hottest directors in Hollywood, Schwarzenegger would become the world's biggest boxoffice star and Hamilton would become the celebrated beauty of a cult television series. Though a sequel seemed inevitable, prospects for launching one were snarled in a spider's web of proprietary interests and legal entanglements until early 1990 when Carolco Pictures stepped in and cleared the way. Eighteen months later, after a grueling six-month shoot and an intense postproduction schedule, one of the biggest films in history was ready for release. Bringing magic to Terminator 2: Judgment Day was an army of effects people — most of them veterans of earlier Cameron productions. 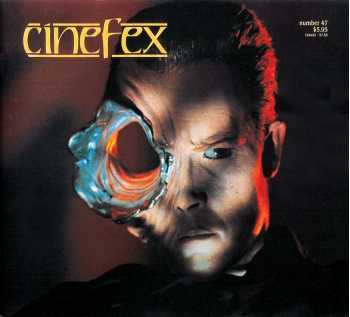 Stan Winston and company were responsible for Terminator makeups and animatronic puppetry. Dennis Muren supervised the creation of an advanced shape-shifting terminator at Industrial Light & Magic. Gene Warren of Fantasy II provided a major truck crash and a future war in miniature while Robert and Dennis Skotak of 4-Ward Productions wreaked nuclear havoc on Los Angeles. Video Image supplied 'Termovision' point-of-view material and Pacific Data Images performed some digital rescue work. The result was an epic foray into science fiction filmmaking.